I had a massage appointment for a Monday before vacation in Sacramento years ago. I sat in the waiting room for a few minutes before looking into my email to see if I was completely wrong on the date, which in fifteen years of getting massages, has never happened! Mind you, my back was so sore, and I needed it SO bad. My therapist is never late, he is always there waiting for me, and he wasn’t so it was unusual. It was me, I was wrong, so sad, and so depressed. Major first world problems, I KNOW. I text him and let him know I was one week off of my appointment and I would have to cancel next weeks appointment as well because I would be out of town. Even more sadness. He could sense my sorrow in the text and said he could come in later that afternoon, on his day off, to get me in. Of course, I gave him an out, I didn’t want him to work on a day off, that’s not ok. But he insisted. I drove home, and looked around for scone ingredients. I always have butter, flour, and milk, naturally. But I needed fruit, or nuts, some flavor. I also always have fruit, and it was January, there were apples! I’d never made apple scones, but I don’t have time to go shopping so I chopped them up and mixed them into my go to scone recipe, added cinnamon, voila apple cinnamon scones! They are tender, comforting, and just like an apple pie, but better. I went to my massage appointment, scones in hand. He was super happy, and proceeded to eat two before the massage and two after. It was a win win for both of us. Feed the people that take care of you and help you right?!! Watch my live TV segement for the “how to” on Portlands KATU CH2 AM Northwest! Place oven rack in center of oven and preheat to 400 degrees. Line baking sheet with parchment paper. Place flour, sugar, baking powder, cinnamon, salt, and baking soda in a large bowl, whisk to combine. 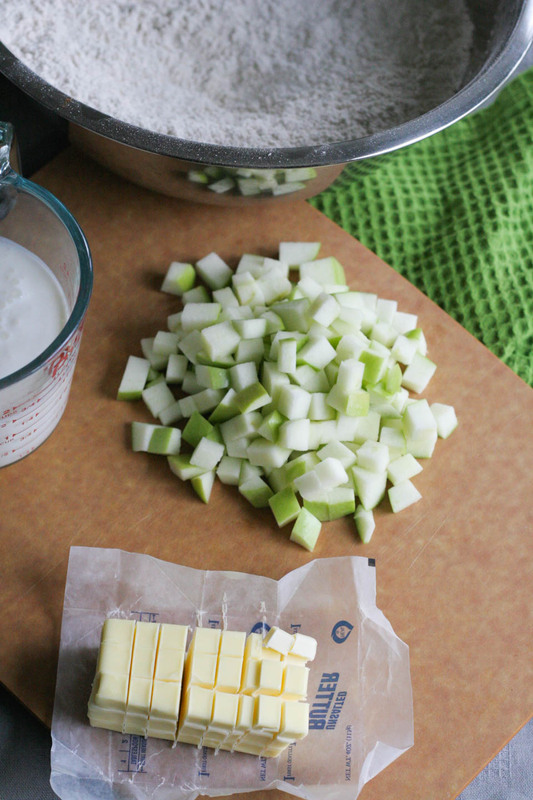 Add ice cold butter cubes, rub butter into flour forming small pea sized chunks using your fingers. Add apples, mix using a spatula. Add buttermilk, using a spatula, combine gently. Turn dough out onto a lightly floured counter. Bring dough together gently, forming a uniform disk, use a bench scraper to cut into two even pieces. Form each piece into a circle 1 1/2 inch thick. Cut each circle into 8 even triangles using a knife or bench scraper. For better results, place unbaked scones in freezer for a minimum for 30 minutes, best overnight. Remove scones from freezer and place on a parchment lined baking sheet. Brush with egg wash and bake for 25 minutes. Remove from oven, and place on cooling rack. Delicious, easy scones. Thank you! These are easy and divine! Just what I wanted for a fall-tasting scone, and using up buttermilk. I topped them with cinnamon sugar. I also made just half of the recipe. That’s an awesome therapist! I would have brought him these delicious looking scones too. I love the pairing of apple and cinnamon. It’s one of my favorites. He is super awesome! Feed them right?!! Thank you. Beautiful! These scones look like the perfect breakfast! Thank you, Annie. I agree! I’m a sucker for scones and these are right up my alley. Cinnamon and apple anything equals comfort. I love scones….and cinnamon….and apples. Thank you, Kathy! My sentiments exactly. These look wonderful! I love apples and cinnamon together – yum! Me too! Thank you, Ashley! This is my favorite scone flavor (right word?) I use a layer of caramel sauce to make them caramel apple scones!! Yum! Oh wowowowo, I am sure they are amazing! Great lesson here: definitely keep your massage therapist happy :)! I would be too if I had some of these scones!! Haha! Right?!! I have a massage today, my once a month, and he will get more scones lol! My husband thinks I bribe him :). These look so yummy! I’d love one with a cup of hot tea! Tea and scones, a classic delicious treat! 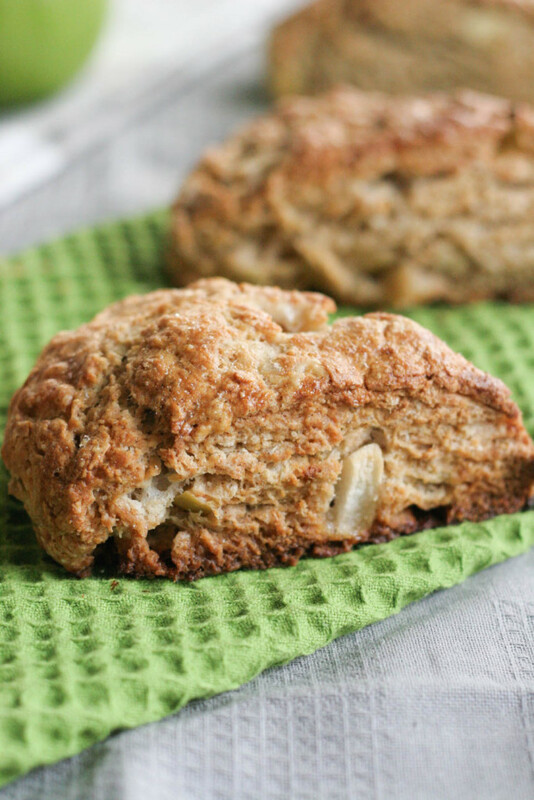 I love scones, and the addition of apple and cinnamon sounds fabulous! Yum! With a little cream and maybe some apple butter on top. Yum yum! Oh, how I would love one (or two or three) of these right now with a cup of tea…like apple pie in a scone. Lovely! Awe, thank you so much! They are pretty tasty :). Definitely a win-win! 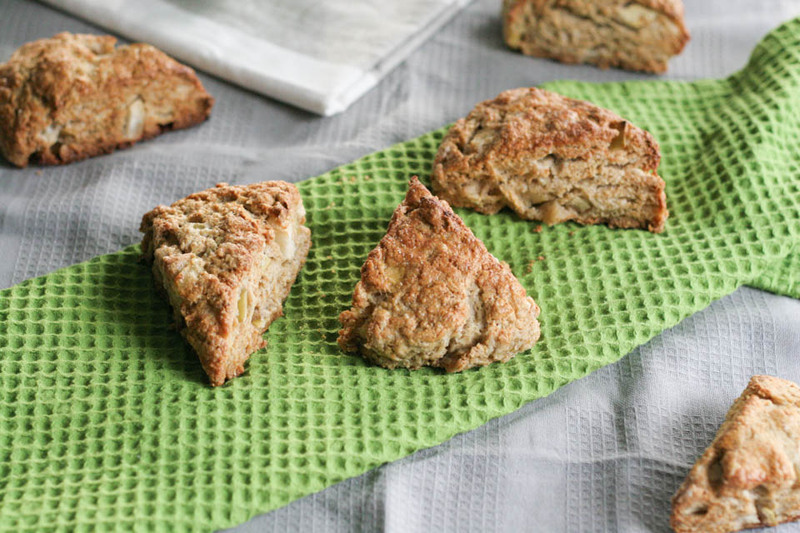 I wish I could grab a couple of these scones myself…I love the apple-cinnamon flavor combo! Thank you, Faith! Come on over, I have so many!! !